A major fire raged for hours at an apartment complex for seniors just blocks from the Washington Navy Yard. A number of residents were rescued via ladder. Others were pushed out in wheelchairs. U.S. Marines ran to the scene to help. 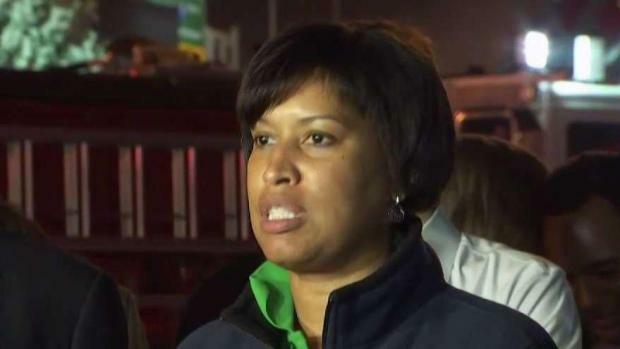 All residents are accounted for, D.C. fire officials believe. Update: Fire officials are investigating whether fire alarms in the building worked properly. Go here for an update. 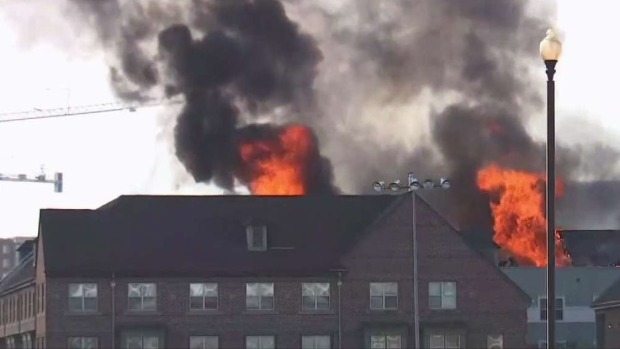 An apartment complex for seniors near the Washington Navy Yard caught fire Wednesday afternoon and burned for more than eight hours, forcing dozens of seniors out of their homes. Ten seniors were taken to hospitals for non-life-threatening injuries after the heavy fire broke out at the Arthur Capper Senior Apartments, in the 900 block of 5th Street SE, about 3:30 p.m. Wednesday. Residents were rushed to safety, some in wheelchairs. Firefighters were set to do another search of the building Thursday. 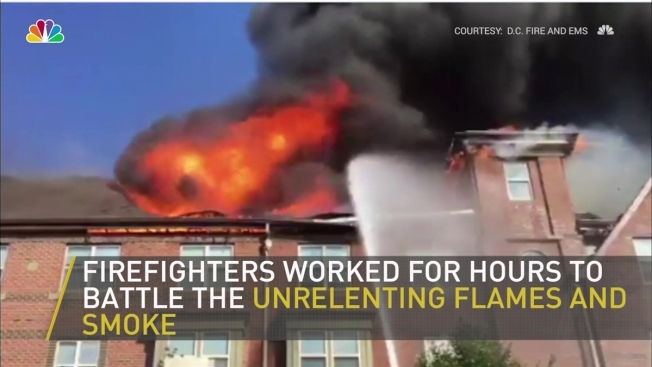 About 100 U.S. Marines ran toward the building and carried seniors out of their apartments after spotting the smoke, D.C. Fire Chief Gregory Dean said. Marines and others could be seen rushing toward the four-story building pushing stretchers and wheelchairs. 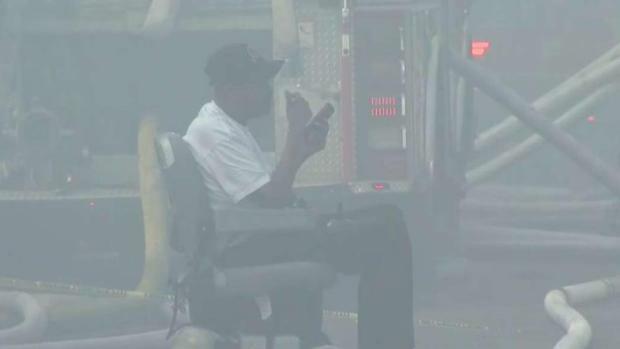 D.C. firefighters rescued several people using ladders. Ten seniors were taken to hospitals with non-life-threatening injuries. Louis Watts used a walker to get his father out of the building. "Someone knocked on the door, 'Get out! Fire! Fire! Fire!' Watts said. His father was in bed at the time. He got dressed quickly, and they were able to get out. "No sprinklers went off. No nothing went off," Watts said, echoing what a number of residents said about a lack of both sprinklers and smoke alarms. Resident Linda Gray was leaving to go to Bible study when she heard banging on apartment doors. "I heard all this noise, and they said get out," she said. Dean said at the late-night news conference that the fire marshal's office would investigate whether the apartment building's alarm system worked. "Fire alarm systems have battery backups. There's a lot of things that go along. We do not have the answer for that at this time. It's too early for us," the fire chief said. Dean said the building was last inspected a year ago. Crews will work to determine the cause of the fire. It is believed to have started on the roof, the assistant fire chief said. Several roads in the area were closed ahead of the evening rush hour. At least one exit of Southeast/Southwest Freeway (I-695) also was closed. 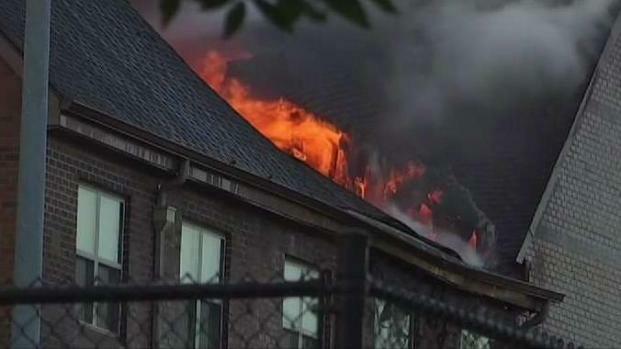 A woman told News4's Jackie Bensen about how she fled her senior home when a fire broke out. Another man spoke about helping his elderly father get out. D.C. Council member Charles Allen, who represents the area, said displaced residents could find immediate shelter at the Capper Community Center at 1000 5th St. SE. "Given how vulnerable this population is, the city is going to be working all night to make sure everyone has a safe place to stay," Allen said in a statement.